Seven-inch tablets are very hot now. Google Nexus 7 is sold very well in summer and Kindle Fire HD 7 are popular with its low price but amazing features. Apple just unveiled its 7.9-inch iPad mini and Apple makes it very clear: they really focus on handy device market, so a real handheld and popular tablet will be released into the market soon! iPad mini has features in common with iPad 2 including the same screen display resolution. No doubt that it is more convenient to hold iPad mini in one hand, in other word, that is more convenient to have fun or work with iPad mini on the way than that of big iPad. 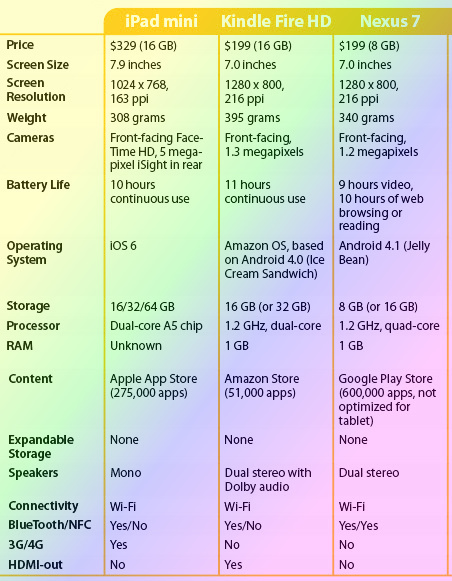 Compare with Nexus 7 and Kindle Fire HD in all technical features, if you plan to buy a 7-inch tablet, below table make senes to you. Release date: iPad mini goes on sale on Nov.2, both Nexus 7 and 7-inch Kindle Fire HD are already on sale (July 13, 2012 for Nexus 7 and September 14, 2012 for Kindle Fire HD 7). Price: Wi-Fi version of iPad mini starts at 329 USD for the 16GB model, rising to 429 USD for the 32GB and 529 USD for the 64GB. Higher price for the Cellular version: 459 USD for 16GB, 559 USD for 32GB and 659 USD for 64GB. The two rival tablets are cheaper than iPad mini: $199 (8GB), $249 (16GB) for Nexus 7 and $199 (16BG), $249 (32GB) for Kindle Fire HD 7. Display: iPad mini: 7.9-inch 1024 x 768 display runs at the lowest resolution among three here, but it still runs normal iPad apps without problems. Both rival tablets have seven-inch, 1280 x 800 HD display with Gorilla Glass. Kindle Fire HD also has a Micro-HDMI connector for HD video output. Storage: iPad mini comes with a choice of 16GB, 32GB or 64GB versions, while both rivals come in two flavors: Nexus in 8GB and 16GB and Kindle in 16GB and 32GB versions. None of the three devices supports flash memory cards (Samsung Galaxy Tab supports flash memory card). Note: OS needs some of that storage: Amazon says that the Kindle Fire HD gives you around 12.6GB on the 16GB model and 26.9GB on the 32GB, while iOS 6 takes around 1GB of the iPad mini's storage space. Battery - The iPad Mini boasts 10 hours of WiFi and nine hours of 4G. Nexus 7 has a battery of 4,325 mAh, which is 10.1 hours video battery life, while Kindle Fire HD has 4,400 mAh, which is worth 5.1 hours video battery life. Dimensions and weight: iPad mini: 200 x 134.7 x 7.2 millimeters and 308 grams. The Nexus 7 is 198.5 x 120 x 10.45 millimeters and weighs 340 grams. Kindle Fire HD: 193 x 137 x 10.3 millimeters and 395 grams. iPad mini is the lightest one among three. Color: iPad mini: black and white; Kindle Fire HD: dark grey, Nexus 7: black. It is hard to tell as no sales data with iPad mini yet, now is too soon to say who wins. Nexus 7 and Kindle Fire HD 7 have taken a large part of 7-inch tablet market since they have been released earlier of this year. No doubt that Apple fans will follow the iPad mini and will they make great sales record for Apple again with iPad mini? 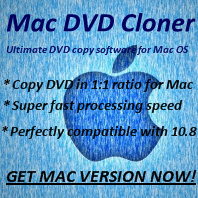 Any DVD Cloner Platinum: Rip DVD to video formats: MP4, M4V and MKV. A powerful DVD to mobile devices ripping software. Support converting DVD to hot and popular moible devices including iPad mini, Samsung Galaxy Tab, Samsung Galaxy S2/S3, HTC One X, Sony Xperia series, iPhone 4S, iPhone 5, etc. Copyright © 2005-2019 DVDSmith Inc., All Rights Reserved.